If you want to lure them in, you have to build them a house -- a bird house that is. The average garden receives a visit from at least 15 to 20 species of birds. So, how can you encourage them to stay? Build them a home, provide water and food, and they will become your best of friends. Bird houses are not just for the birds! They are charming decorations all on their own. Both functional and ornate, a new bird house in your garden is just the thing to bring in new life any time of year. In order to discover the best bird house for your garden, you have to understand the basics of bird behavior. Many varieties of birds migrate and will need a new home each season. Most gardeners are surprised to learn that the robins searching for the worms during the springtime rain are often not the same birds they saw in the garden last fall. Although they look the same, robins actually do migrate and replace themselves throughout various climates at different times of the year. No matter what their species, all birds need to build a nest each breeding season to nurture their young. This is a necessity your garden can provide. It all happens in the springtime flutter. Some bird varieties arrive simultaneously, both male and female, and create a nest together. With other species, the males will scout out the perfect home to attract a future mate and woo her with his duds. Many birds return to the same garden each year, once they have found that perfect nesting place. Learning to encourage these fine feathered friends to stay and reproduce in your own garden offers the gardener many benefits. Not only are they interesting to watch and entertaining to listen to, they also hunt down all your standard garden pests. If you spend a lot of time at home or in your garden, or have elderly people or children living with you, birds can be a true natural delight. The reproductive cycle is an educational process from the nest building to the eggs hatching to the eventual fledgling learning to spread its wings. Life is happening right before your eyes. Additionally, different species of birds have particular preferences about their nesting environments. If you are interested in attracting a particular bird species or have been having trouble enticing birds to move into your bird houses, check with a local chapter of the Audubon Society or the Fish & Wildlife Department for the specific needs of birds in your area. Some of the most popular bird homes are gourds. Basically built out of dried vegetables, these houses are perfect for the purple martins. They have actually become so popular that more purple martins reproduce in a human-made gourd house than any other type of nest. Some varieties of bird also care intensely about how a bird house is hung. Certain varieties love the swinging types, as this kind of bird house deters larger predator birds. Others will only move into a slightly hidden, securely attached home. Houses with perches are only good for the aggressive birds, since the perches make a home invasion easy. The size and shape of the entrance hole can make a huge difference in regards to who will move in. Some birds avoid houses altogether, preferring to nest in plants, on the ground, or on a ledge. You can still encourage these types by offering open nesting boxes, appropriate ground cover like rock or brush piles, or planting native shrubs. There are also houses specific to other flying creatures including bats, owls, ducks and even butterflies. All offer additional garden benefits you may want to explore. The most important tip in providing bird shelters for your garden is to learn from the birds. They want to be safe from predators, dry and warm, and close to food and water sources. Also, you will need to keep the following factors in mind while planning your yard's new addition. Whether you buy or make your own bird house, be sure it is easy to clean. All bird boxes will need a thorough cleaning after the nesting season has ended. Put it on your list of Fall Garden Tasks. 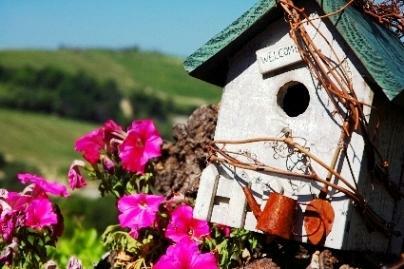 A decorative bird house can be made more practical by adding necessities like air and drainage holes. To avoid bird distress, houses must be placed a proper distance apart. In a typical garden, each bird's nest should be 60 to 100 feet apart. If you have cats, raccoons, or other bird predators in your yard, add some aluminum flashes around the pole or tree to protect the bird's eggs and babies.